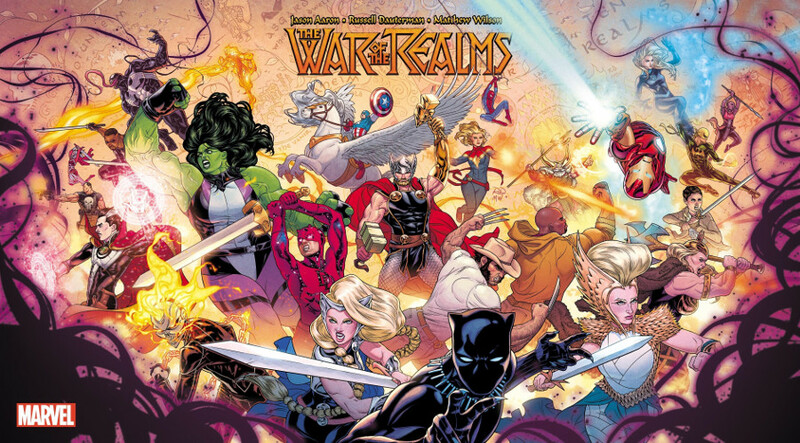 Marvel Comics announces a new event with The War of the Realms which will feature a large number of characters including Thor, Captain America, Jane Foster, Daredevil, Blade, Wolverine, Captain Marvel, and more! Details include that it will be released April 2018 from the team behind Mighty Thor with writer Jason Aaron, artist Russell Dauterman, and colorist Matt Wilson. Malekith the Dark Elf has been rampaging across the Realms for years, and now he's coming for Midgard. There, the Super Heroes of the Marvel Universe make their final stand, and a war begins. So, why is Captain America riding a winged horse? Where does Jane Foster come into play? How does Wolverine get involved? Why does Daredevil have a sword...and why is he covered in starry lights? The Punisher, Luke Cage, Iron Fist; how do these street-level heroes join the fight? How do Venom, She-Hulk, Black Panther, Spider-Man, Captain Marvel, Iron Man, Doctor Strange, Ghost Rider, and so many more team-up for the war? And is that Blade! ?